Annoying household maintenance doesn’t need eat up the weekends like it used to. Why spend precious free time tip-toeing around a rooftop cleaning gutters when that time could be spent out on the golf course or at the beach? Contract with a local Melbourne gutter cleaning company today to save time and energy on keeping those rooftop gutters clear. Currently there are no vetted and verified Melbourne gutter cleaning companies. We hope to have our first companies listed in the very near future. Conveniently located to cater to Melbourne’s eastern suburbs, Grayson’s offers more than just general clearing services, they also provide gutter guard installation, gutter guard repair and tree-trimming services to ensure similar problems don’t occur in the future. PorterVac applies modern vacuum technology to comprehensively remove dirt, debris and gutter clogging build-up. By using mechanised removal methods, PorterVac aims to save its customers time and money by spending less time on the job. With three full-time technicians and supplemental support provided by seasonally-based labor, PorterVac can provide flexible scheduling to accommodate most—if not all—timetables. Possessing a quarter century of gutter cleaning experience, Lesters has kept thousands of clients happy by employing timely, professional and comprehensively insured technicians. 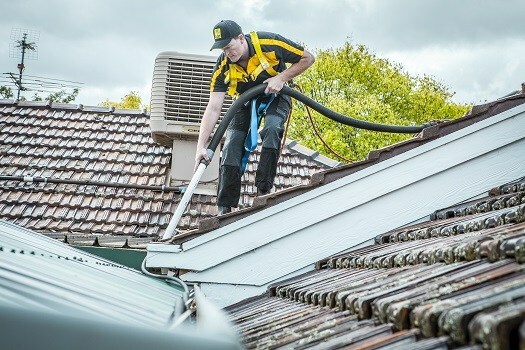 Lesters Gutter Cleaning Melbourne guarantees the quality of their work and can usually provide a no-obligation, on-site quote within 24 hours of a request being made. No, it’s not as fast as a quote over the phone, but it does means the quote you get is the quote you pay for—no floating prices. Unlike other gutter cleaners using vacuum or hand clearing methods, Pressure Point uses the natural power of pressurised water to flush gutters clean from seasonal build-up and debris. Check out their website to see testimonials from former customers, as well as a series of “before and after” photos from previous worksites to get a full-understanding of what Pressure Point can provide. Owning a small fleet of specialised vacuum trucks, Apex can accepts both residential and commercial gutter cleaning jobs. Apex stresses their commitment to safety with formal training, specialised safety equipment and height qualifications. They also have a hydro-excavation truck for anyone needing excavation work. One of the most well-known gutter cleaning businesses in the greater Melbourne area, OZWide leaves no stone—or leaf—unturned when it comes to getting gutters and downpipes as clear as the day they were first installed. Serving the entire Greater Melbourne region, including the Geelong and Mornington Peninsula, OZWide is always ready to send one of their truck or trailer mounted vacuum cleaning units to any property, large or small, commercial or residential. Vacuum-based cleaning system means quicker service and zero clean-up after gutter and downpipe clearance. A free, online blog to help customers both old and new stay informed about gutter cleaning, maintenance and preservation. Get your windows cleaned by our recommended window cleaning companies in Melbourne.